BELOW:- Reproduced from ‘Swanbourne – History of an Anglo-Saxon town’ by the late Ken Reading (reproduced by permission of his relatives). Of leading importance in Swanbourne, from the time that records began in the 16th Century, until the Fremantles finally bought them out in the 19th Century, the Deverals were numerous in the district. Some rich, some poor, some pillars of the Church, others pioneers of non-conformism. 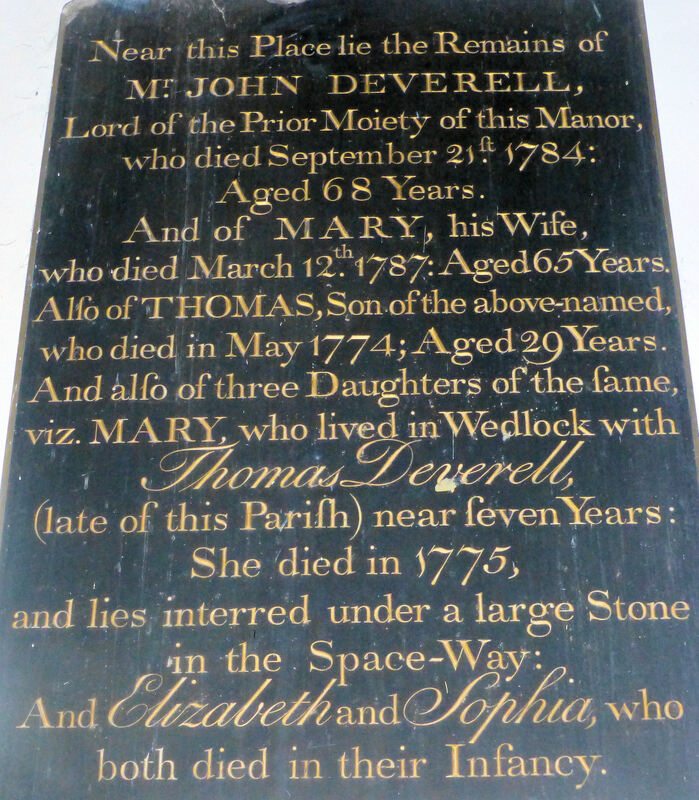 The name Deveral has a pure Norman sound, my own feeling is that it may have been derived from `De la Veel`. The V. C. H. tells us of the `Veel` family who held lands at Swanbourne as early as the 13th Century. The field known as `Vealles Close` near to the furlong known as `Vealles` was in the hands of the Deverals as early as the 16th Century. This paddock was described in the enclosure documents as Ian Gresham`s old enclosure and can be traced about 100 yards behind Ivy Farmhouse (No. 17 Smithfield End). The oldest comprehensive lists of inhabitants to come down to us occurs in the Certificate of Musters 1522 and The Subsidy Rolls of 1524, a list of taxpayers. The assessment for tax was based mainly on goods and wages paid. 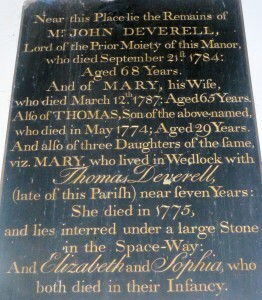 It is significant that John Deveral stands out as the greatest taxpayer in the Parish, being assessed at thirty pounds. No other resident being assessed at more than twenty-five pounds. This John Deveral by his will of 5 July 1559 left a windmill to his son Augustine as well as the aforementioned `Vealles Close` to his son Matthew. This fragmentation of the Deveral estates seems to have been resolved by 1597 when John Deveral of Swanbourne left `the old windmill’ standing on Church Hill` to his son John and the `new windmill` to his son William. These two mills are shown on Sir John Fortesque`s estate map of 1600. Early in that century one Thomas Deveral had a son, Thomas, who was to become `Major Thomas Deveral` of some prominence and obviously an officer in the parliamentary army. This Thomas had `a seate of five foote square` erected in the church `next to the wall before the pulpit` in 1658, no doubt following the example of churchwarden John Deveral who had a `seate of five foote and three fingers in length and four foote in breadth in a waste place under the pulpit`. But all could not have been well for these obvious pillars of the church, as according to Archbishop Sheldon`s report of 1669, nonconformists met `At the house of George Deveral Yeoman; not above twenty mean people; taught by William Giles shopkeeper and Hartnal, a Thatcher. William Giles probably came from Winslow and `Hartnal` was a well known Baptist from North Marston. Left by the will of 1559 to Augustine Deveral was `Pray` House and ‘Pray Close’. Probably Brises Farmhouse and considerable rights. Also in the occupation of the family was No.11 Smithfield End with the Home Close behind known as `Sheepcote Leys` or `Varneys` and the old house standing on the site of No. 29a Nearton End, with lands to the south. `Maudlins Farm` later known as `Ivy House` passed from the Deverals to the Gresham family in the 17th Century. The Manor House of Major Thomas Deveral was without doubt `Grange Hill Farm` now known as `The Home Farm`. Major Thomas was blessed with six daughters and one son Thomas who died at the age of thirty two in 1699 followed by his wife Ann, aged twenty four, both of the Small Pox. Upon Major Thomas`s death, five years later, the estate was divided between the six daughters and their husbands. As one of the daughters had married a John Deveral of Swanbourne the house stayed in the family, but at the time of enclosure, in 1763, the amount of ground left with the estate was little in proportion to the size of the house. Field names surviving today as `Majors Piece`, `Carters Ground` and `Nichols Ploughing` immortalise the Major and two of his sons in law. Home Farmhouse, formerly Grange Hill farmhouse. Once the home of Major Thomas Deveral. On 9 January 1750; the Lord of the Manor, Josias Askew was buried. By the terms of his will John Deveral, Ironmonger of Winslow, the son of John Deveral late of Biggin Farm, Granborough, grazier, received the Manor of Swanbourne, being the house known as `The Stone House` and the land belonging. Three years earlier a John Deveral had purchased `David Stowes House` a very fine timber framed Tudor building standing by the site of the present day war memorial. This was a Manor House of the Godwins. Viz. This reference to ‘John Deveral of Biggin’ is of particular interest, as Browne Willis the historian refers to the ancient chapel of Biggin being pulled down by ‘John Deveral of Swanbourne’ about the time of the restoration of the Monarchy. I would think it probable that the new Lord of the Manor resided at Deverals Farmhouse, as this might explain the relics of prosperity within, that survive today, namely an Adam fireplace and an ornate corner cupboard. The joint Lord of the Manor of Swanbourne James Adams, was residing at Little Horwood at this time, so John Deveral must have enjoyed a position of priority in the village until his death in 1784. From reading between the lines of the Wynne Diaries one concludes that the coming of the Fremantles in 1798 did not go down well with the Deverals. The great show of patronage and grandeur was way beyond their means to compete with, and the consequent resentment led to some friction between the families. This is revealed by comment of Captain Fremantle in a letter to his wife, dated 17 March 1801: `I am not surprised to hear your neighbour Mrs M Deveral is going to leave Swanbourne; however, I think you will have no great loss in her, or in any of that NAME`. Deverals Farm was Captain Fremantles first serious purchase of agricultural land. Betsy Wynne wrote `We are to be great farmers`. Later in 1847 Sir Thomas was to have the satisfaction of purchasing the last Deveral holding and demolishing the Manor House of the Godwins. This was an act of supreme vandalism by the standards of today. At that time the ‘Stone House’,, the Manor House of our time, was also scheduled for demolition. Confusion regarding the descent of lands is inevitable as the Deverals were so numerous in the village during the 17th and 18th Century. In fact, they were so numerous that the entries in the Church book resort to the use of nicknames and addresses. The entries of John Deveral Vulgo Long, Thomas Deveral Vulgo Major, Mr. William Deveral of Nearton, Will of Duckend and Thomas of Noreton (Nearton) occur. At enclosure John Deveral ‘The Younger’ received a huge award of land, second only to James Adams. These lands had their origin in the holdings of Askew [Adams] and Godwin as well as Deveral. These awards all in the West or ‘Hay’ Field. In 1709 William Deveral was appointed chief Constable of the Cottesloe Hundred. The list of electors in Swanbourne dated 1713 reveals that no less than one third of the freeholders were named Deveral. The total electorate 24, Deverals 8. At enclosure in 1763 no major beneficiary was not either married to, or decended from, a Deveral. In 1783, the Will of John Deveral gent. Reveals personal occupation of what is now Nos. 4 & 6. Station Road and ownership of Holcombe Farm, described as his ‘West Down Bargain.’ Also ‘School House Close’ and adjacent plots described as his ‘Pightle’ and ‘Home Close’ These remnants of the Godwin Estates seem to have derived from some kind of exchange with Robert Carter.